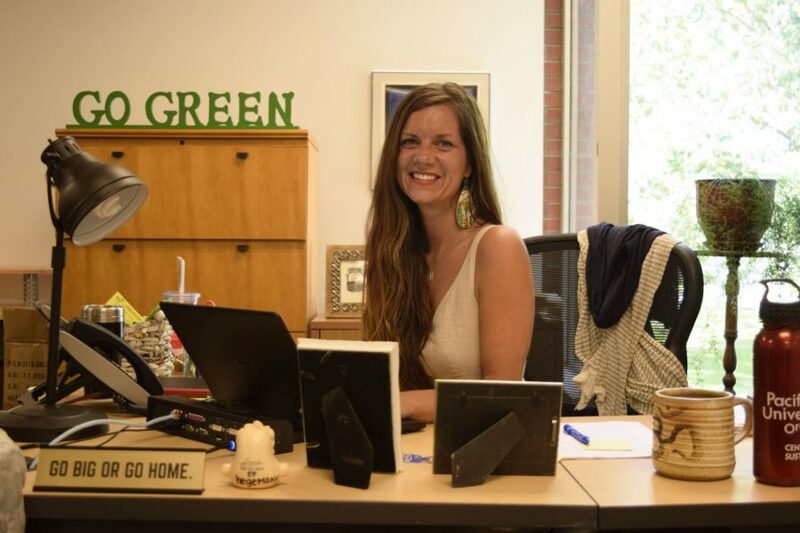 New director for the Center for a Sustainable Society Michelle Larkins hopes to make Pacific a sustainability leader among Pacific Northwest colleges in the coming years. The Center for a Sustainable Society (CSS) plays a major role in Pacific University’s sustainable programs and outreach within the community. This work can not be done without the hard working students and faculty who dedicate several hours a week to making Pacific a more sustainable environment. The new director of CSS, Michelle Larkins, will be continuing that work during this school year. Larkins graduated from Michigan State University with a PhD in Community Sustainability where her research examined how gender, ethnicity and migration influenced access to resources and ultimately how it impacts sustainability outcomes. Larkins also worked as a researcher for the Global Center for Food Systems Innovation working on sustainability initiatives and ethical market development for women farmers in Malawi, Africa. Before arriving at Pacific, Larkins taught Environmental Science in Colorado, where she would often spend her spare time outdoors. In addition to focusing her efforts on sustainability, Larkins enjoys going out on her wooden kayak whenever she gets a chance. Pacific was of particular interest to her when she realized how many opportunities there were both in and outside of the classroom to engage with the student body. As the semester rolls forward, Larkins hopes to initiate more opportunities for students to participate in sustainability research across disciplines and majors.